Learning investing lingo can be difficult. Even getting started with the basics can be confusing as there are many companies competing for our investment dollars. A few days ago, I asked my youngest son if he knew what a brokerage firm was. He's the smart one in the family but having never invested in the stock market (as a college student), he wasn't sure exactly whether a broker was a person or a place. (The term refers to both a person who recommends and sells stocks AND a brick-and-mortar company that executes orders for clients online, in person, or over the phone). 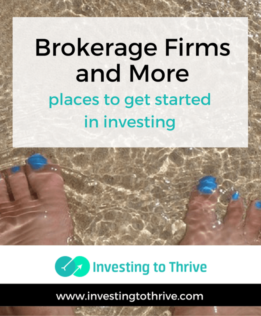 It got me thinking that people often invest in the stock market in ways that don't involve dealing with a brokerage firm. Brokerage firm Generally, I can buy any stock available on the New York Stock Exchange (NYSE) and NASDAQ Stock Exchange through a discount brokerage firm, such as E*Trade, Fidelity, Schwab, and TD Ameritrade. Typically, I can also buy mutual funds and ETFs that contain stocks as well as penny stocks available through the Over-the-Counter Bulletin Board (OTCBB). Traditional, full-service (and higher-priced) brokerage firms, such as Merrill Lynch (owned by Bank of America) and Morgan Stanley, are still around. But they tend to promote financial advisory and wealth management services rather than the simple execution of stock purchase and sell orders. Designed to serve: the investor who'd like to build and manage an investment portfolio on her own. An employer I have had employers who offered a 401(k) plan that allowed me to invest in the stock market. Such a retirement plan allows me to contribute to my own individual account within the plan and possibly receive matching contributions from the employer. My investment choices may include company stock, index funds, and target date funds. In addition, an employer may offer company stock through employee stock purchase plans (ESPPs, which may allow employees to purchase stock at a discounted price), employee stock ownership plans (ESOPs, which allow companies to give stock to employees), or other programs. Investment advisory firmThere are two main types of investment advisory firms: robo advisors that use algorithms to develop client portfolios; and private advisors, who construct custom portfolios for clients. I can check to be sure that a firm is an SEC-registered investment advisor. I can invest in exchange-traded funds (ETFs) through robo advisors and managed portfolio providers, such as Betterment, FutureAdvisor, and Wealthfront. Such firms may have a sister company or partner that offers brokerage services for the investment advisory arm. For example, Betterment Securities provides brokerage services to Betterment LLC clients; FutureAdvisor handles transactions through client accounts at Fidelity Investments and TD Ameritrade; and Wealthfront uses Apex Clearing Corporation.Private advisors may invest money in ETFs but may also buy and sell individual stocks and mutual funds on my behalf. Like FutureAdvisor, they may manage my portfolio but my money could be held by a discount brokerage firm like TD Ameritrade. See my managed portfolio and robo advisors comparison to learn more about this investment method. Mutual fund companyMany mutual fund companies sell mutual funds directly to investors. These funds often contain baskets of stocks, including those associated with a certain market index or those selected according to a specific criteria. For example, I can buy mutual funds from Janus and T. Rowe Price. I don't have to open a brokerage account to buy these funds. However, I may be able to buy certain funds through an account with a brokerage firm. In some cases, buying directly from the fund company can save administrative and transaction fees. Bank-related firmA company affiliated with my bank may offer brokerage services or investment advisory services. For example, WellsTrade (associated with Wells Fargo) offers brokerage products and services through Wells Fargo Advisors. BB&T enables its customers to buy stocks and other investments through BB&T Investment Services, Inc. Many affiliated firms focus on investment advisory services. Clients are paired with a financial advisor who provides guidance on the selection and purchase of stock and other types of securities. For example, Chase bank customers can buy securities (such as stocks, mutual funds, and ETFs) through JPMorgan Securities but investment selections and securities transactions are orchestrated by financial advisors. There are many ways to get started in investing. In fact, someone who considers herself (or himself) a non-investor may already be investing in the stock market through an employer's retirement and/or profit-sharing plans, even if she (or he) doesn't have a brokerage account. She may have started investing through a robo-advisor because of its simplicity. Or she may have been referred by her banker to an affiliated investment firm. All these places offer valid ways to invest in the stock market. When I talk to friends about investing or read about investing, I often notice differences in investment philosophies, strategies, ways that professionals interact with clients, fees and pricing structures, types of offerings, and more — based on the type of company that facilitates investing. Fortunately, I choose where (and how) I want to invest based on what's best for me.